Boxing Day is traditionally the day when fox hunters up and down Britain ride out to satisfy their bloodlust. Since 2004 it’s been illegal to hunt them with hounds, but this hasn’t stopped the Countryside Alliance from continuing to campaign for the repeal of the law. Mike reported over at Vox Political that a quarter of a million fox hunters were expected to ride to hounds on that day. And David Cameron wanted to see parliament repeal the law. You shouldn’t be surprised at that. He is, after all, a blue-blooded aristo, so the hunt’s almost certainly in his primal nature. Along with snobbery and an absolute contempt for those he regards as merely human animals, like the poor, disabled and working class. Cameron was to be disappointed. The general public don’t want the ban lifted. Mike reported the findings of a poll, which said that 83 per cent of people don’t want a return to hunting with dogs. There’s also very strong support for the ban inside Cameron’s own party, with 70 Tories MPs stating they would vote against lifting the ban. Mike also quotes the BBC News, where Tracey Crouch stated that Parliament has far better things to do than debate fox hunting. So who are the proud supports of fox hunting? Well, from the experience of a group of my friends in Cheltenham, aristocratic Tory grotesques. I was up visiting them once, when they’d gone out for the day to enjoy themselves at the races. They’d had a good time watching the horses, and had even won a bit a money gambling, but came back in a foul mood. What had spoiled their day? The fox hunting crew. So it’s true. The British aristocracy really are chinless wonders. One of the women was so annoyed with the crew that she immediately sat down to play a particularly violent computer game. It was set in a post-Holocaust future, so presumably she was getting the urge to beat horribly deformed mutants to death out of her system. It all rather reminded me of one of Robert Rankin’s fantasy novels: Armageddon – the Musical. This is an SF tale in which Elvis Presley and Barry the Time Sprout combat the forces of the Anti-Christ in a Britain devastated by a nuclear holocaust. Among the book’s villains are a sect of cannibals, the Devianti. Whereas other cannibals in SF books set in a post-Apocalyptic future tend to be an extrapolation of the poor White trash in the American Deep South, or violent urban subcultures, like the Bikers in the Mad Max films, the Devianti are true blue aristos. As an indication of their exalted social status, they wear their Barbour waxed jackets outside their anti-nuclear survival suits. Going by what my friends said that day, I don’t think you have to travel into a future devastated by nuclear war to encounter mutants like them. They’re already here, deformed through generations of inbreeding, and with an insatiable thirst for blood and violence. This is shown in foxhunting, and in the massive bullying that goes on at the elite Public Schools. And they aren’t leaving it for a nuclear war to destroy Britain. Their policies are already doing that, as they seek to vent their hatred of Britain’s poor, sick and unemployed. This ain’t Science Fiction any more. The mutants are here, and called Tories. This is another meme I found over at the SlatUKIP facebook site. 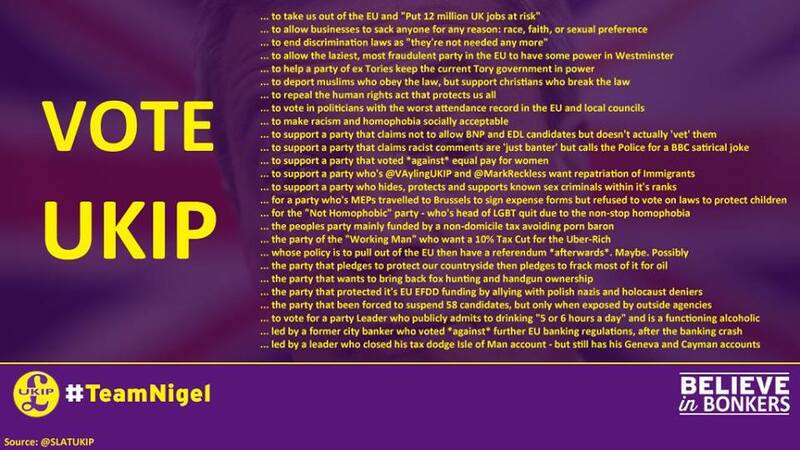 It’s their tweets from last night, collected into a comprehensive list of reasons why no-one should vote for the Kippers. It was done by one of their readers, OgdenW. It comprehensively describes the double standards and mendacity of a party, which consistently tries to present an image of happy moderation while standing for the extreme right, bigotry and intolerance. The list of reasons includes its racism, its hatred of immigrants, Islamophobia, anti-women’s rights and hatred and contempt for LGBT. It also lists it’s policies in favour of stripping working people of their employment rights and furthering their exploitation, as well as their support for fox-hunting, fracking and other policies, which would wreck the countryside. As well as their support for gun ownership. It also shows how we would lose trade if we left the EU, contrary to the Kippers’ predictions. And finally, there’s the personal faults of Farage himself, a millionaire banker, who is definitely not a ‘man of the people’, as well as a ‘functioning alcoholic’ who spends 5-6 hours a day by his own admission in pubs. * Defending the hunting ban. *Banning the use of wild animals in circuses. * Ending the badger culls. * Tackling wildlife crime and reducing cruelty on shooting estates. *Leading the fight against animal cruelty across the world. Here’s another terrific Labour Party policy announcement that seems to have been overlooked by the news media: Animal protection. Mike’s piece is at http://voxpoliticalonline.com/2015/02/22/labours-plan-to-protect-animals/. Read it for a further description of the policy. These are actually good, sensible policies. Despite the noise made by the Countryside Alliance, as various bloggers have recently revealed, most people in the countryside don’t support fox hunting. I personally know people from a farming background, who are very strongly against it. As for the use of wild animals in circuses, this has been a scandal for years. The great broadcaster, Ludovic Kennedy, who I remember for hosting the television review programme Did You See ..?, was very clear in his disapproval of circuses that featured performing wild animals. A number of circuses today don’t use them, a movement that began, as I recall, back in the 1990s. And people naturally love domestic animals, to the point where, shockingly, the amount given to animal charities is actually greater than that for children. Don’t get me wrong on this – I’m not arguing that people should give less for animals, only that children deserve more. Despite this, there are indeed cases of terrible abuse and neglect inflicted on dogs and cats. Clearly, some extra protection is appropriate here. Mike points out that nothing like this has been put forward by the Tories. Quite the opposite. They have decided to spend taxpayer’s money subsidising grouse shooting. Because of the desperate poverty and near destitution of all the great landowners and their shooting estates north of the border. Such as, presumably, the former Tory treasurer, Lord McAlpin. Way back in the 1990s he was repeatedly in the pages of Private Eye, because rare birds of prey were turning up poisoned on his estate in the highlands. No-one was prosecuted, and it looks like any investigation was either impeded or very half-hearted. Mind you, perhaps it’s too much to believe that the Tories will be much interested in protecting animals. After all, they really don’t like humans much, and especially not if they’re poor. So we can expect more Tory opposition to this, based not on its feasibility, but simply because the Tories will resent what they see as their right to pursue the usual aristocratic sports of hunting and shooting.